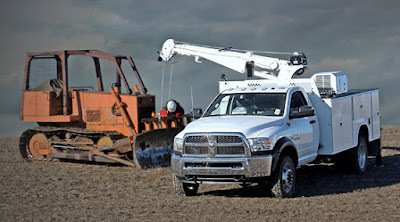 For 2016, the Ram Commercial lineup will offer each of its heavy-duty pickup truck chassis cabs — the Ram 3500, 4500 and 5500 — with a power-takeoff (known as PTO units) option in several different configurations, more than any truckmaker in the segment. A PTO unit is a mechanical setup that typically runs off the transmission, using engine power to operate equipment while the truck is stationary, such as an external compressor, generator, water pump, post-hole digger, landscaping cutters or just about anything else that requires energy. It's not unusual for heavy-duty pickups to offer a PTO option, especially when special-purpose customers or industries are involved (such as oil, forestry and mining), but what is unusual is the array of choices available to chassis-cab buyers. 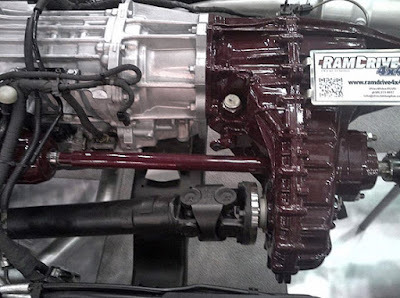 Ram's PTO feature can be ordered on any of its three chassis-cab models with either the 6.4-liter gas engine or the 6.7-liter inline six-cylinder turbo-diesel and with 4x2 or 4x4 drivelines. Buyers also can choose whether to position the PTO on the right or left side of the vehicle — depending on the driveline and/or powertrain choices. All models of the Ford Super Duty chassis cab (F-450, F-550, F-650 and F-750) can be ordered with a PTO option; the first two offered with a stationary model for gas (V-10) or diesel (V-8), the medium-duty trucks offer three different types of PTO, called "live drive," but must be ordered with the Power Stroke diesel and can operate either stationary or while driving ($280). GM offers a chassis-cab model for its GMC or Chevrolet one-ton trucks (GM offers nothing larger) and only offers a PTO option for the six-speed Allison transmission (standard with the Duramax turbo-diesel). The Ram PTO reportedly provides a best-in-class 60 horsepower and 250 pounds-feet of torque, at a cost of $295. Ram Commercial has a network of 950 dedicated dealerships across the U.S. and Canada.